Hannu Tam. Picture: Tony North. Lancaster City boss Phil Brown has told striker Hannu Tam not to worry after the youngster missed the crucial penalty on Tuesday night. The Dolly Blues went out of the League Cup at Workington on penalties 5-4 after the game had ended 0-0. Tam fail to convert in sudden death during the shoot-out after each team had missed one penalty each. “Hannu Tam missed in sudden death and I felt for him a little bit,” said Brown. “But he shouldn’t feel bad. I was pretty happy with his performance. His energy was very good. “He had a couple of opportunities to get the goal certainly in the second half where he probably should have done better. “But his creativity and work rate was good and he caused them problems. “He can be happy with that – he just needed to finish thatoff with a goal and as football sometimes goes, he then misses the penalty. Despite exiting the cup, Brown was pleased to see a number of his squad gets some much needed match time. Billy Akrigg, Adam Sumner and Steve Williams all played and have given their manager a selection headache ahead of the trip to Stafford Rangers this weekend. 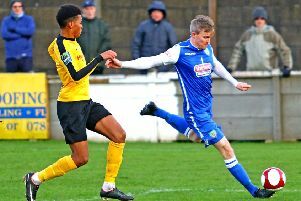 “Billy Akrigg, Steve Williams and Adam Sumner all did well and so I have got some decision to make for this weekend against Stafford Rangers. “They have got every chance of playing. “Billy has not been in the squad due to injury, the other two have been in the squad and they are pushing to keep their places. “But all the team did well and from my point of view as a manager, I wanted a reaction after the Rusall game when we lost 2-0. “I thought we were the better team over the 90 minutes. “First half, they shaded the possession, we shaded the chances. “We should have infront with a couple of opportunities that we had. Brown is looking to build on the performance starting with Stafford followed by the trip to Marineon Tuesday. Brown, who revealed a few of his squad are nursing knocks, will be without Tam this weekend as he is unavailable while Tom Kilifin could come back into the reckoning.